Louis Armstrong's stage personality matched his flashy cornet and trumpet playing. Armstrong is also known for his raspy singing voice. Corona, Queens, New York City, U.S.
Hi Louis Daniel Armstrong (Agosto 4, 1901 – Hulyo 6, 1971), gin-agnayan Satchmo o Pops, usa nga Amerikano nga mantrotrompeta hin jazz ngan magkaranta. 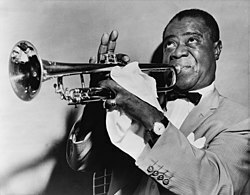 "Louis Armstrong Transcription Project – john p birchall"
Louis Armstrong: discography and early recordings (RealPlayer format) on the Red Hot Jazz website. Nairn, Charlie, (1975): Earl "Fatha" Hines: . 1hr documentary, with much about Louis Armstrong, filmed at Blues Alley jazz club, Washington DC. Produced and directed by Charlie Nairn for UK ATV Television, 1975. Many refs to Louis Armstrong. Original 16mm film, plus out-takes of additional tunes, archived in British Film Institute Library at bfi.org.uk; also at http://www.itvstudios.com; DVD copies with the "Jean Gray Hargrove Music Library" (which holds The Earl Hines Collection/Archive), University of California, Berkeley, California; also at University of Chicago "Hogan Jazz Archive", Tulane University New Orleans and at the Louis Armstrong House Museum Libraries: see also www.jazzonfilm.com/documentaries. Ini nga pakli kataposan nga ginliwat dida han 01:20, 1 Pebrero 2015.